Published by Joshua Clare-Flagg on 24 Sep, 2018. 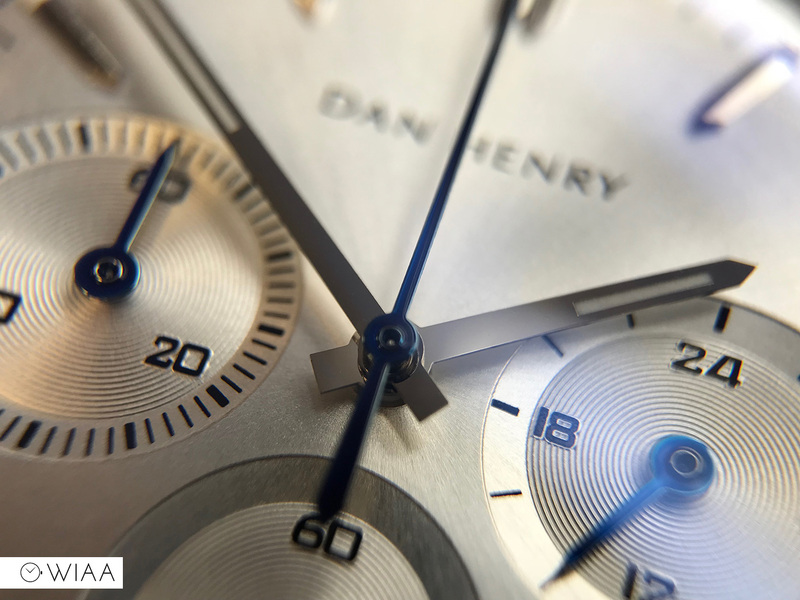 I have reviewed one Dan Henry before, the 1963. 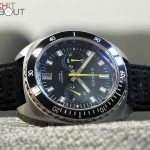 I was impressed by the style and build quality for a very reasonable price. 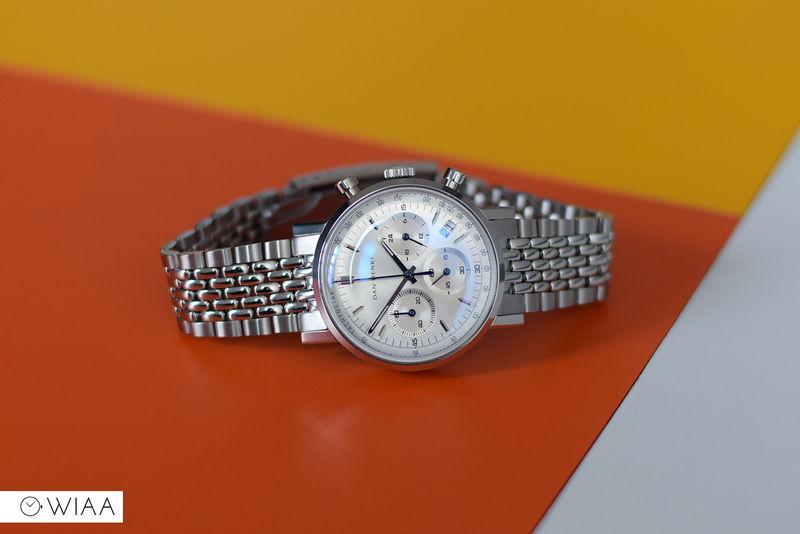 I was eager to get my hands on the model based on the following year, as it looks gorgeous and I knew it would offer a serious bang for buck ratio. 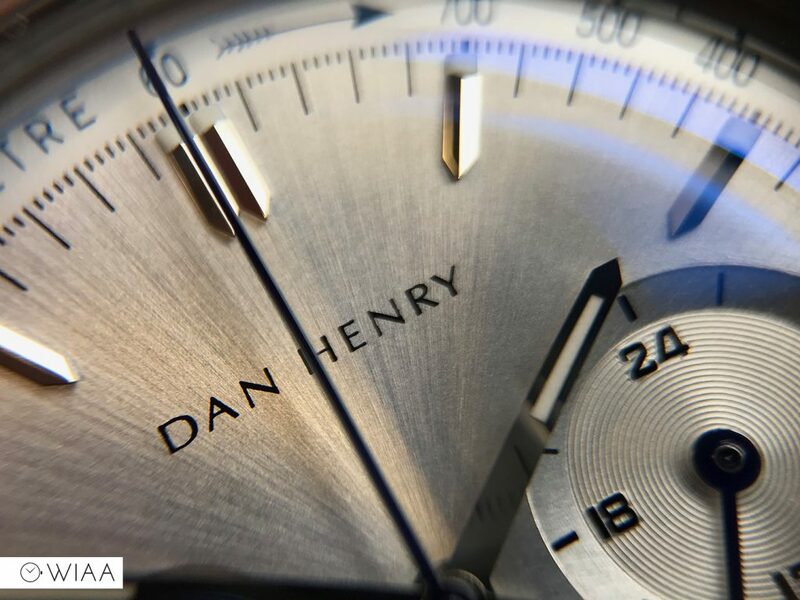 Dan Henry is the man behind http://www.timeline.watch/, a place specialising in info on rare and popular vintage timepieces. 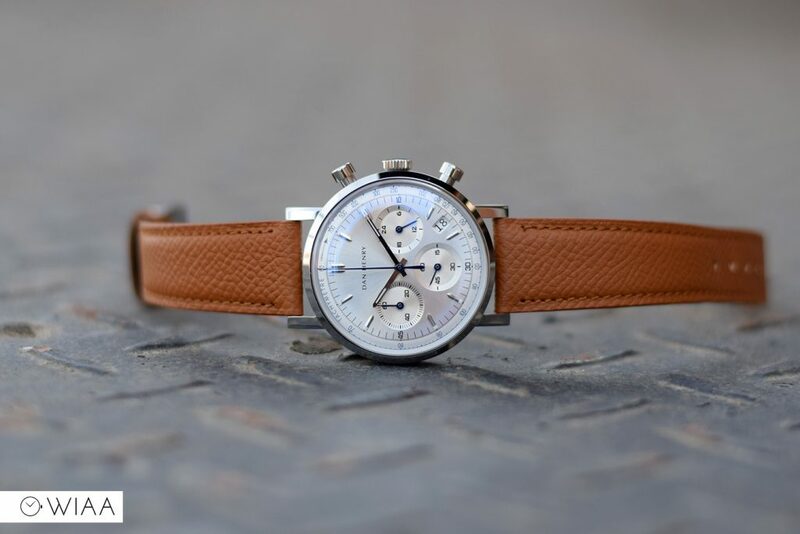 He’s taken his expertise in this field and has created his own line of vintage-inspired watches. 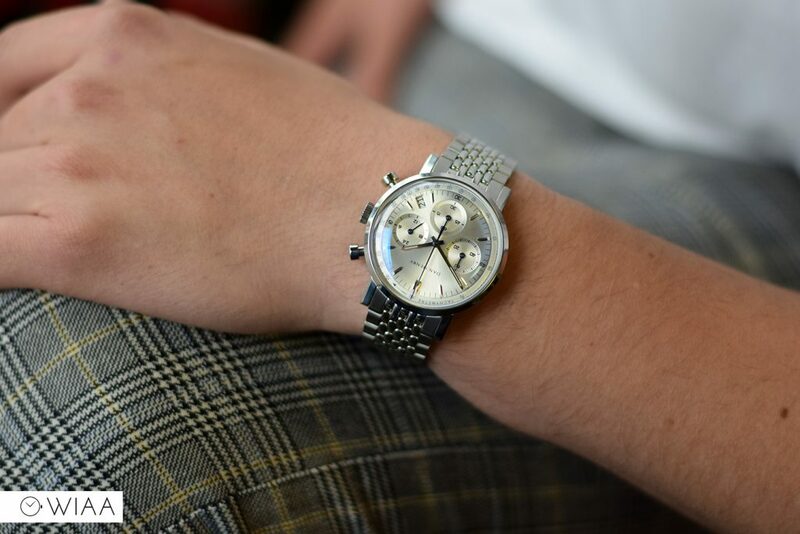 The 1964 is his very latest release. My gut feeling was right; the whole package is impressive: you get a leather strap, bracelet, and genuine leather watch roll – all for under £200. For the unboxing process and to see what you get, watch the video review below. 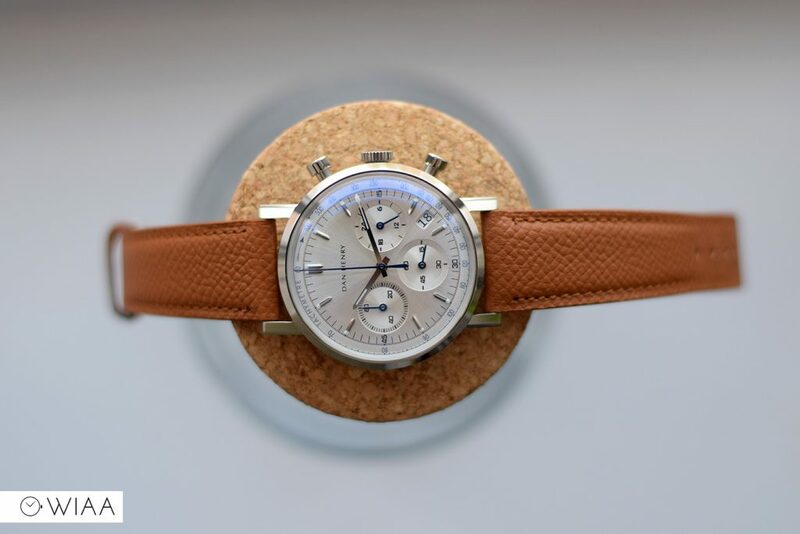 Yes, 38mm is on the small side by modern standards but is in line with the vintage theme of the watch, and I personally think it’s a lovely size. 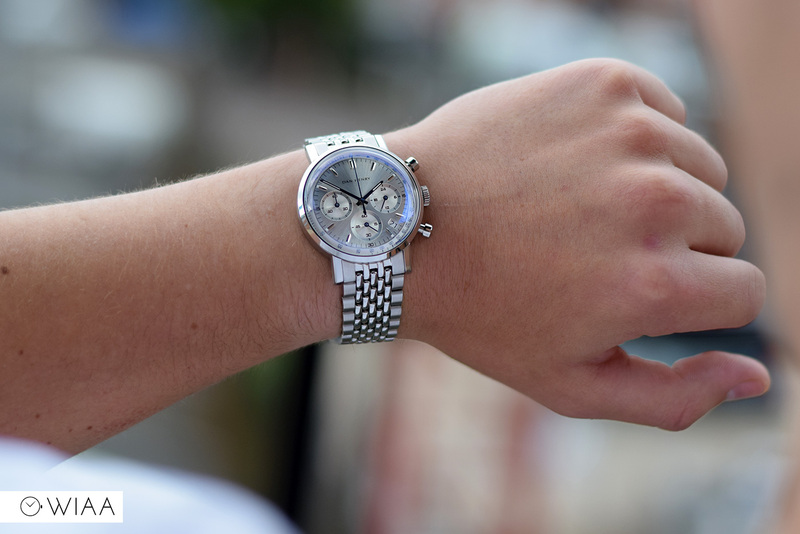 Not too harsh or brash, but classy and elegant on the wrist. 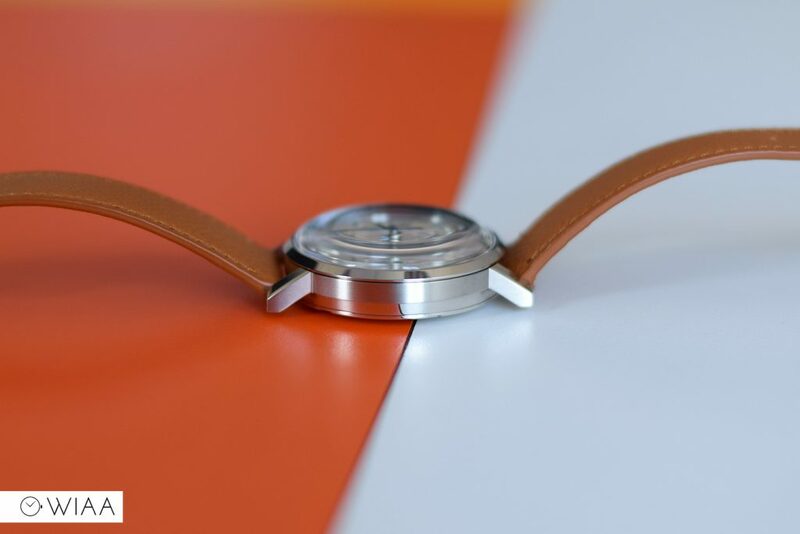 The polished top of bezel and lugs are met with a brushed side (not all the way down the side though), again adjoined by the outer edge of the caseback, which is polished. 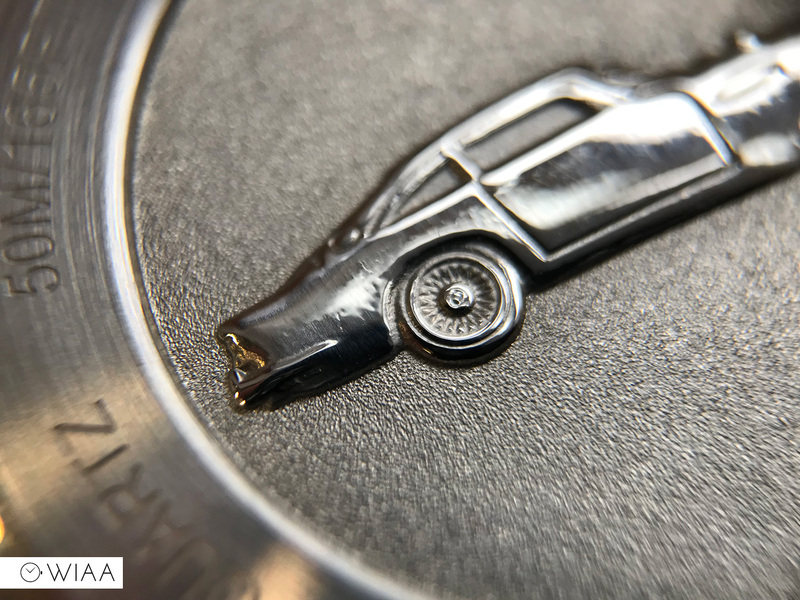 The screw-in caseback has an impressively deep and detailed 3D embossed Aston Martin DB5 in the centre; against a blasted backdrop. 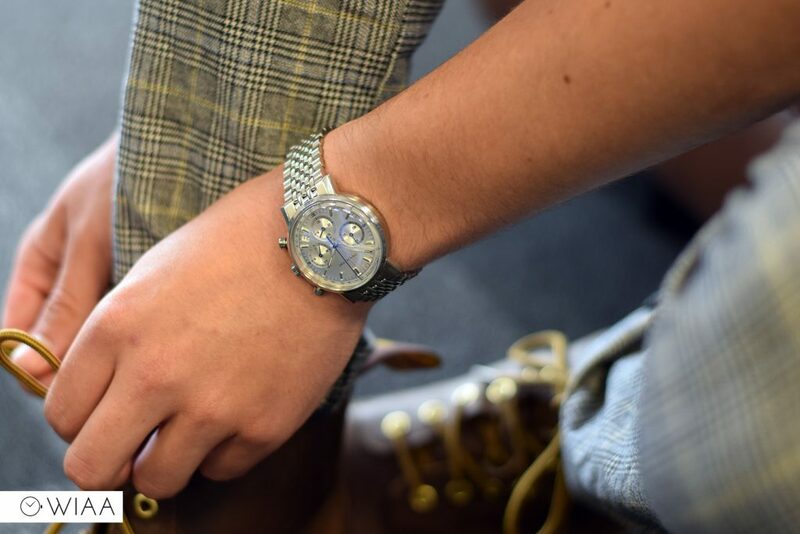 You’re not going to see it too often, but it’s impressive that you get the level of detail on a watch costing this much. The high box-shaped crystal is impressive to look at. 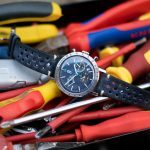 It’s sapphire coated mineral; so whilst this isn’t quite as good as a full-on sapphire, it’s going to be scratch-resistant enough, and can be overlooked for the price you’re paying. It’s double domed, so there’s a dome on the underside to counter-act the rather huge dome on top; the dome creates a really unique viewing experience. 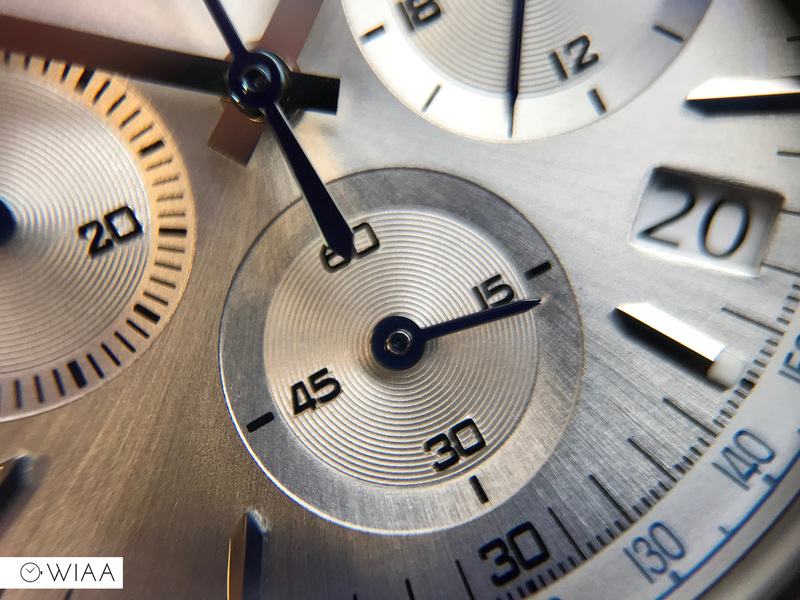 Not only that, the anti-reflective coating is truly stunning – not only is it really effective in providing excellent clarity, it also provides a beautiful flash of blue when the light hits it just right. Just be careful you don’t wallop it due to the height. 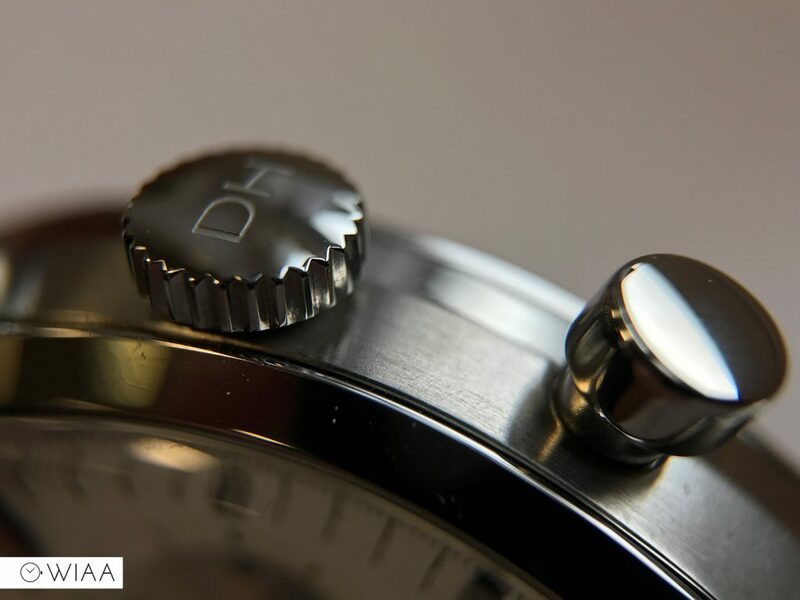 The pinion-style pushers for the chronograph are fully polished and are easy to use. 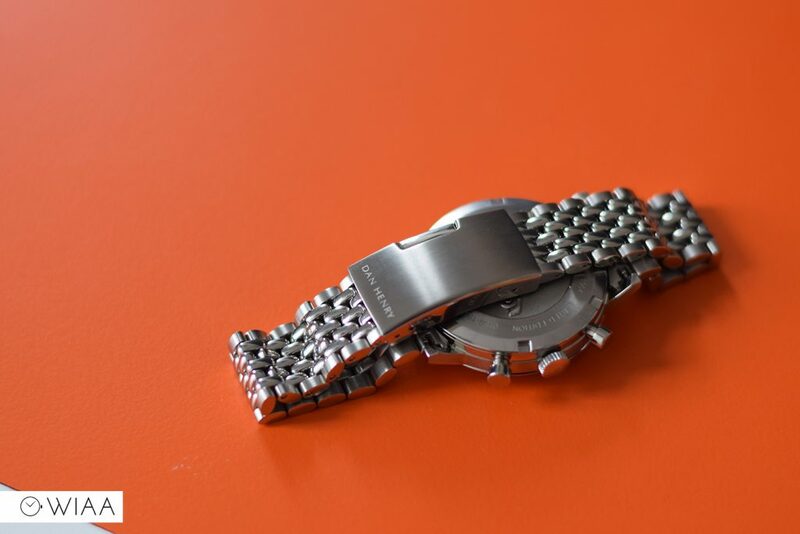 They also provide a really solid clunk whilst using them, mainly thanks to the movement. 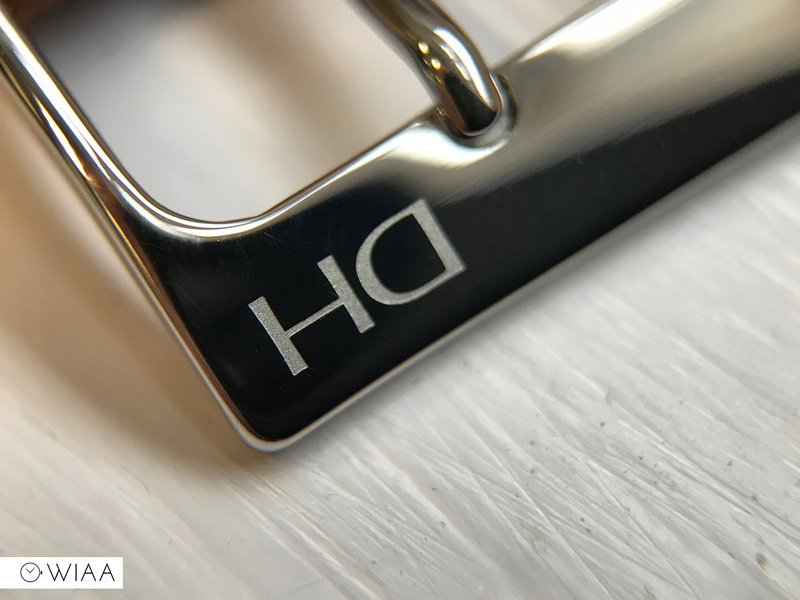 The crown is also fully polished and has the DH from the logo deeply engraved on the end. It’s easy to use and manipulate. 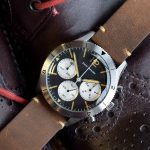 Dan Henry has done a great job on the design of the 1964; I’ve yet to find someone who hasn’t been impressed by this watch. 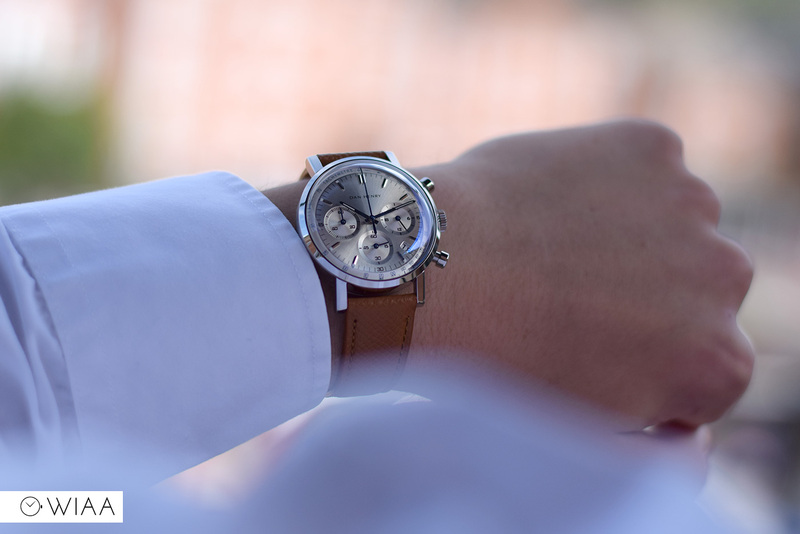 The dial is simple, striking, and so elegant. 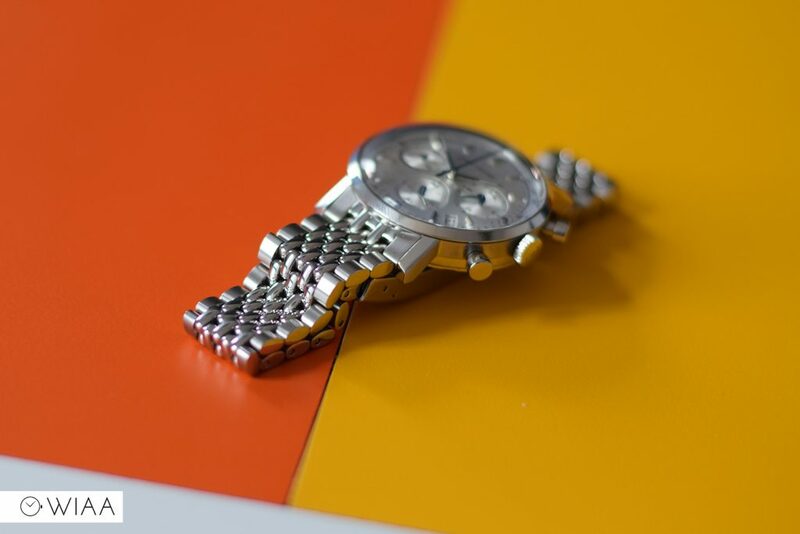 There’s a beautiful sunburst backdrop that sets the scene; working really well with the subdials which have a bevelled edge and concentric circular pattern within. 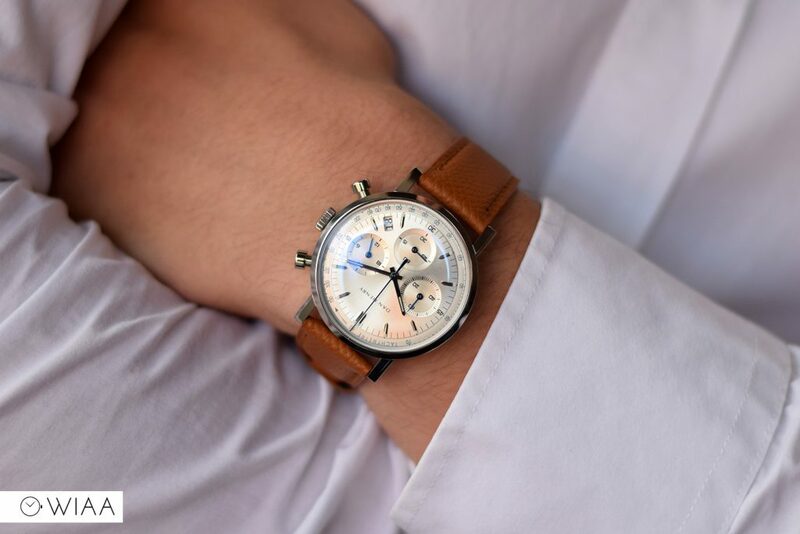 The chronograph minute subdial is at 9, with the running seconds at 6 and 24-hour indicator at 3. 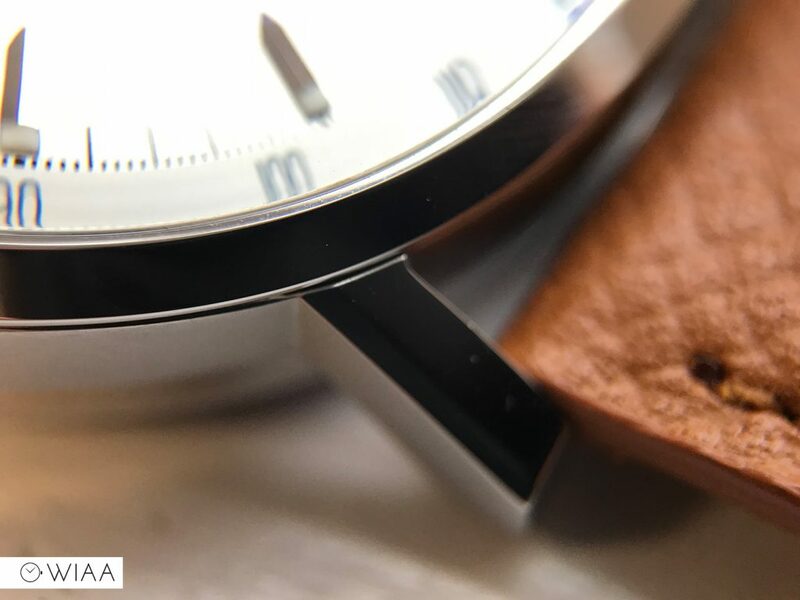 Not only is the crystal heavily domed, but the dial itself is also, and the minute and big seconds hands have curved tips to flow through the curve. Not really noticeable at a glance, but they look great close up. The hour markers are all very well machined – pitched with a lumed block at the base and a pointed tip. 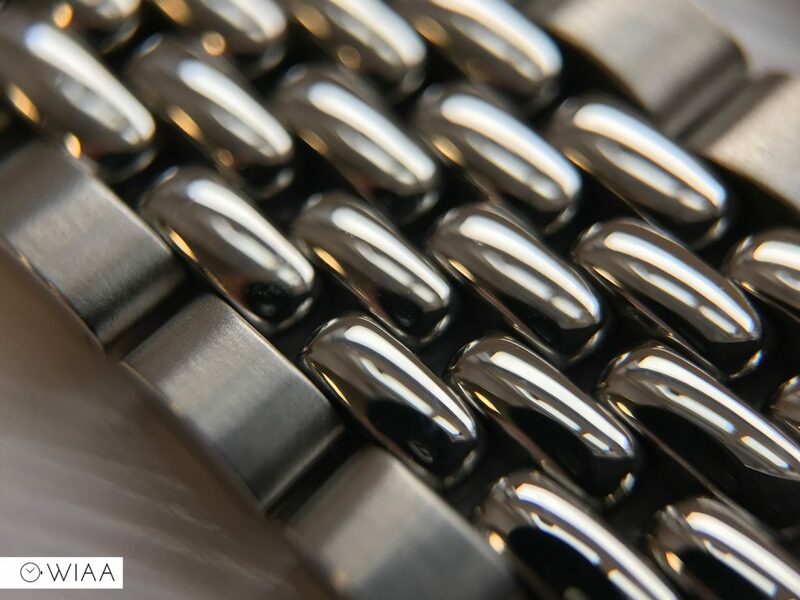 They have a polished finish like the hands, providing a flash of reflection. The hands are on the simple side, with a flat, polished finish and a pointed tip. They have a lumed channel within the end and do a decent job of balancing legibility whilst being eye-catching. 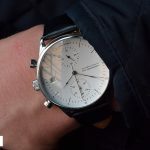 The date window located between 4 and 5 is neatly cut out of the dial, whilst the date wheel itself is a regular white one. 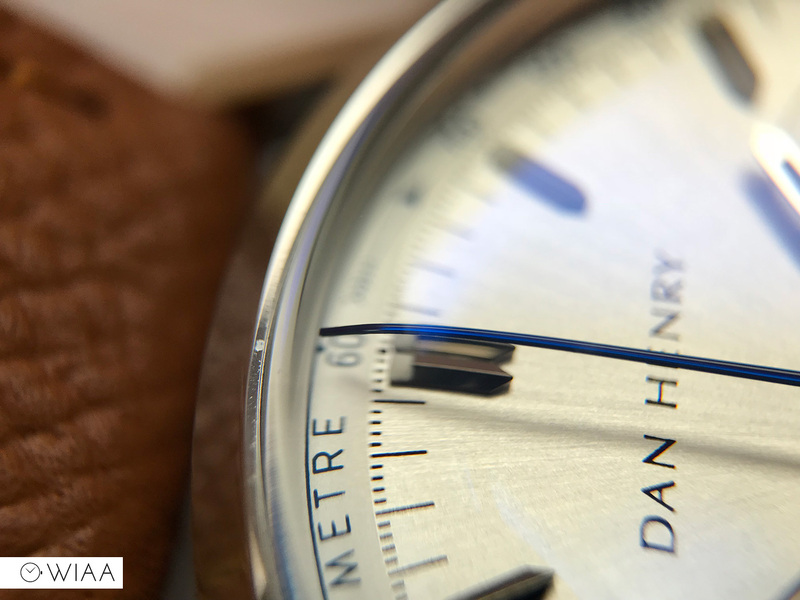 If that’s the kind of thing that bothers you, then thankfully Dan Henry has provided a non-date version of this watch. 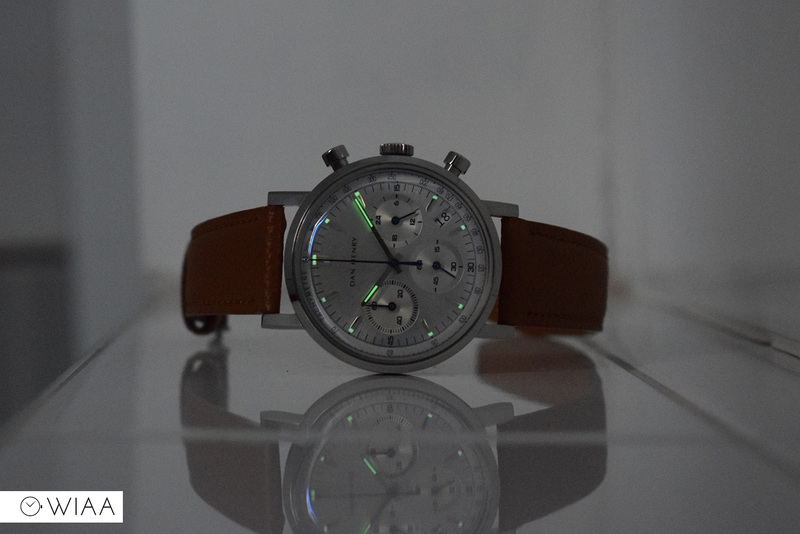 The lume used on the dial is LumiNova, and I’ve got be honest, it’s not really that great at all; it doesn’t glow particularly bright, nor does it charge quickly. 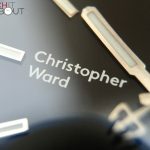 I don’t particularly think string lume is absolutely required on a dress watch, so in my eyes, I’m not too bothered, but who doesn’t want strong lume whatever the case? 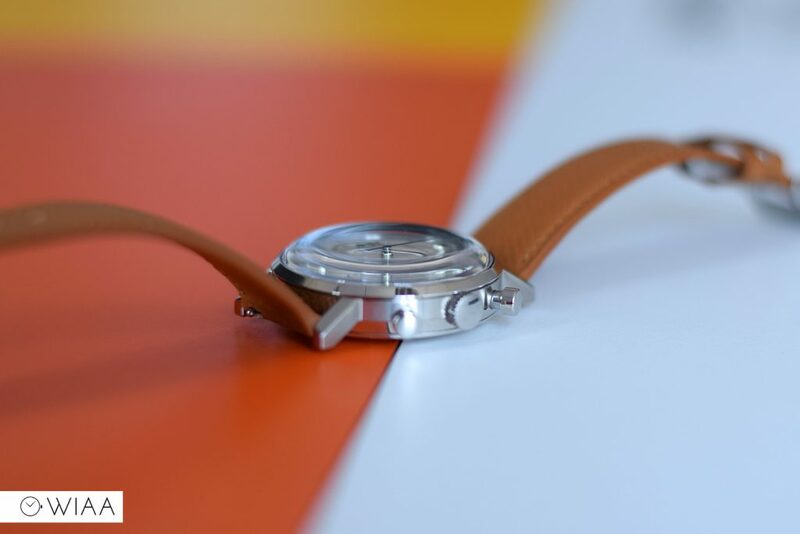 On the outer edge of the dial, where it slopes downwards, is the tachymeter very tastefully designed and printed. 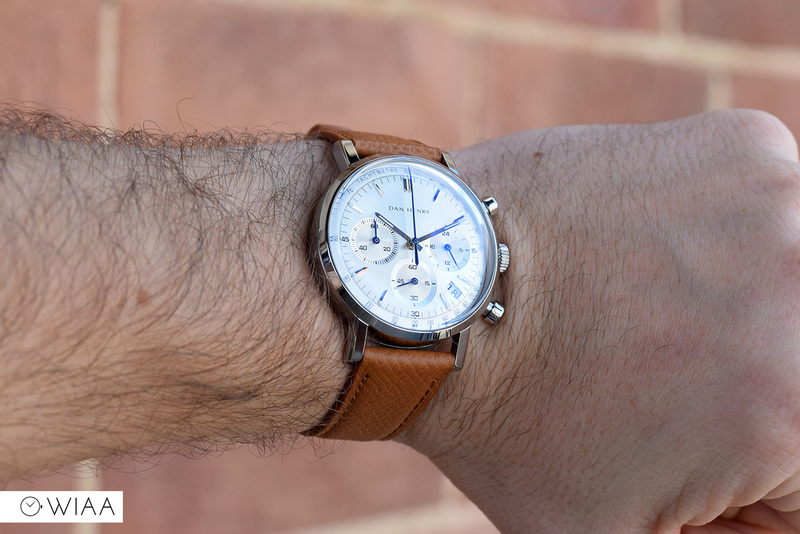 It’s quite bold for Dan Henry to stick to his guns with the strap width too, being just 19mm wide it looks a bit on the thin side for a modern watch. But, this isn’t trying to be a modern watch. 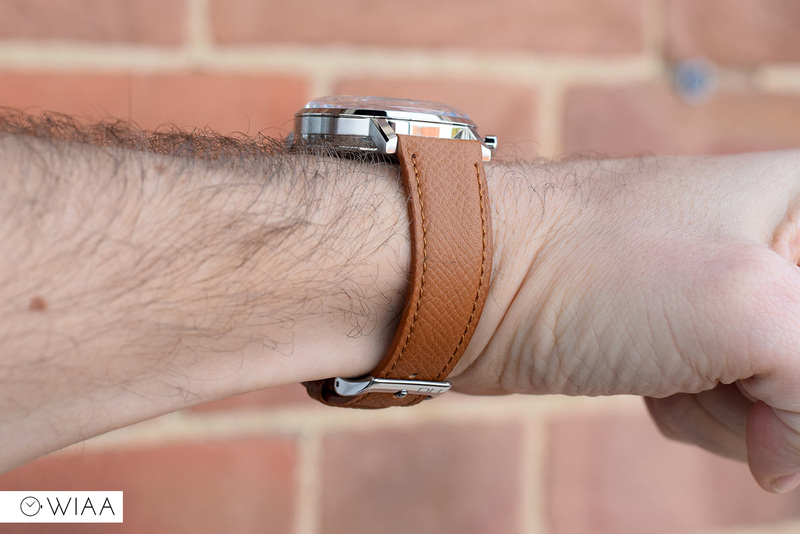 The leather strap is constructed of soft, supple, high-quality leather. 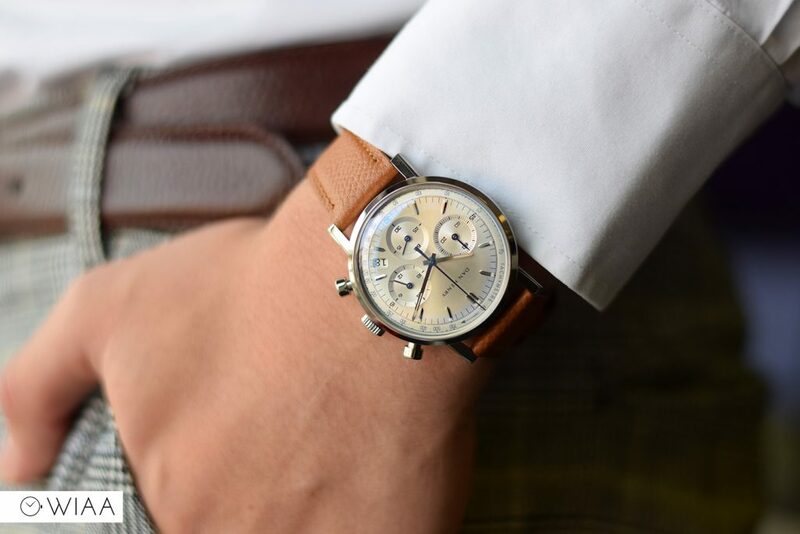 The light tan colour definitely also supports the vintage theme. 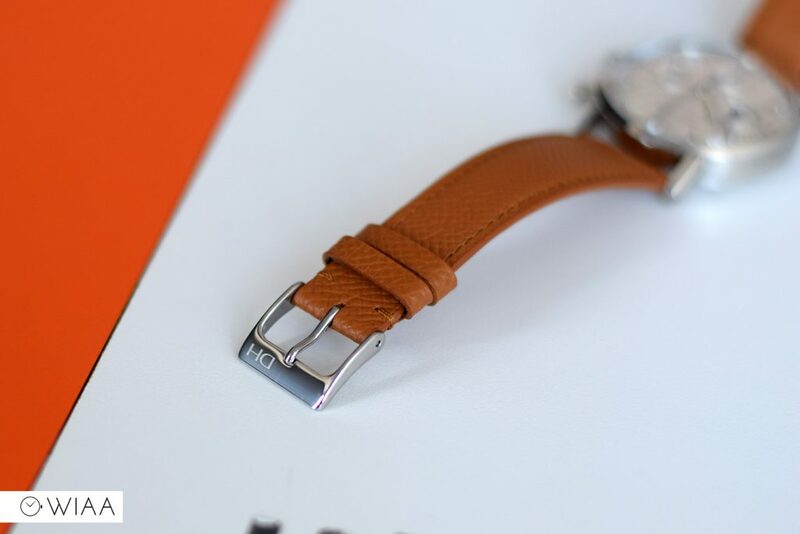 The tang buckle is fully polished, with the DH from the logo lightly etched on one side. From a style perspective, I personally am not so keen on the beads-of-rice bracelet. However, I can certainly appreciate the quality of construction. Five rows of highly-polished bead links are interconnected, flanked by a wider end link with a brushed top and polished sides. The buckle is a little different too which I like; brushed on top with the logo engraved at the base with a polished button which opens it up. It’s a standard deployant buckle underneath the hood; which feels a little flimsy when open. 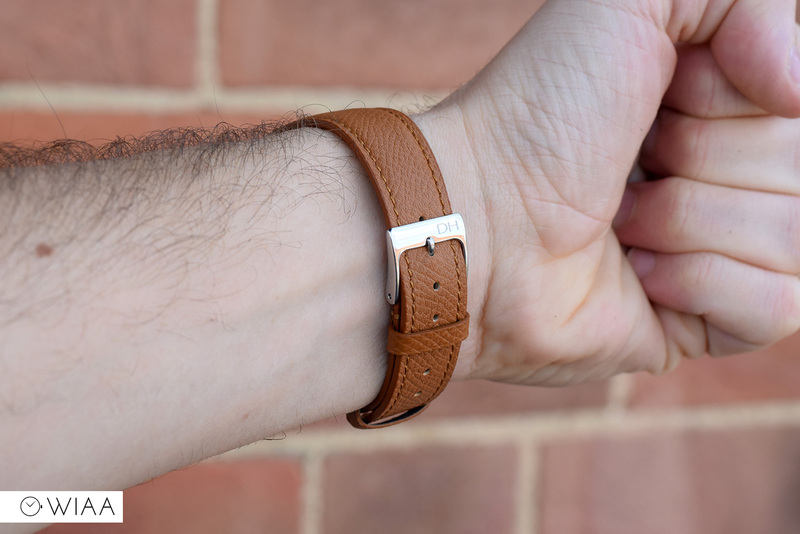 Due to the nature of the bracelet, it’s extremely malleable and thus very comfortable. 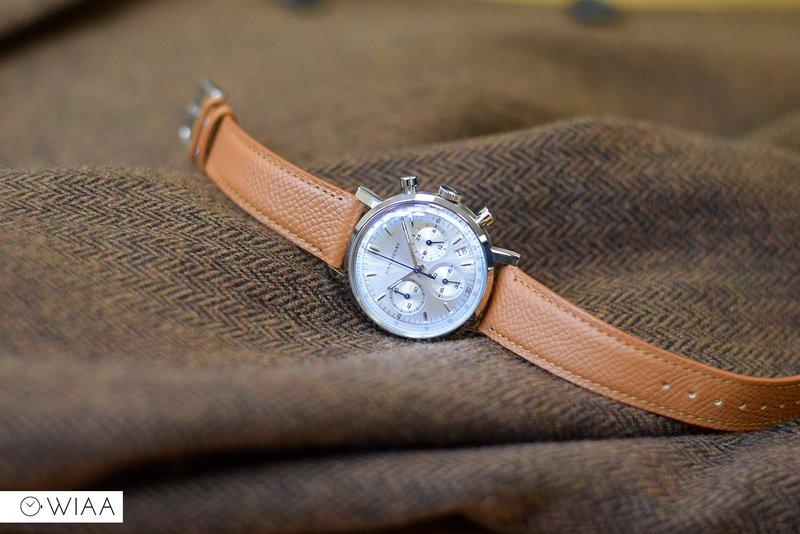 The movement powering the Dan Henry 1964 is the Japanese made Seiko VK63. 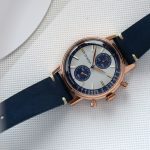 It has a very good reputation as being a hybrid “mecha-quartz” movement: it’s battery powered, with the main time function being quartz, and the chronograph function is driven by a mechanical module (also battery powered, so no winding). 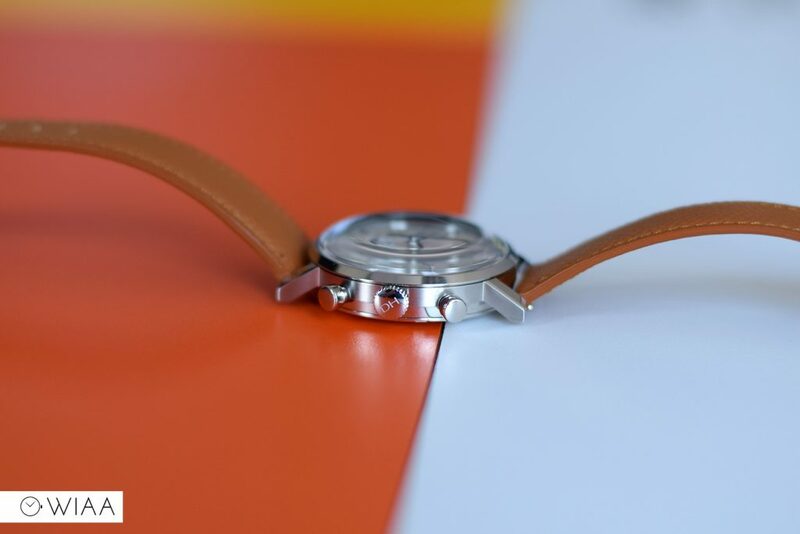 The beat rate of the chrono is 18k bph (5 ticks per second), and it has a 3-year battery life. Well, what can I say? I’m not over-exaggerating, but I’m genuinely pretty speechless. 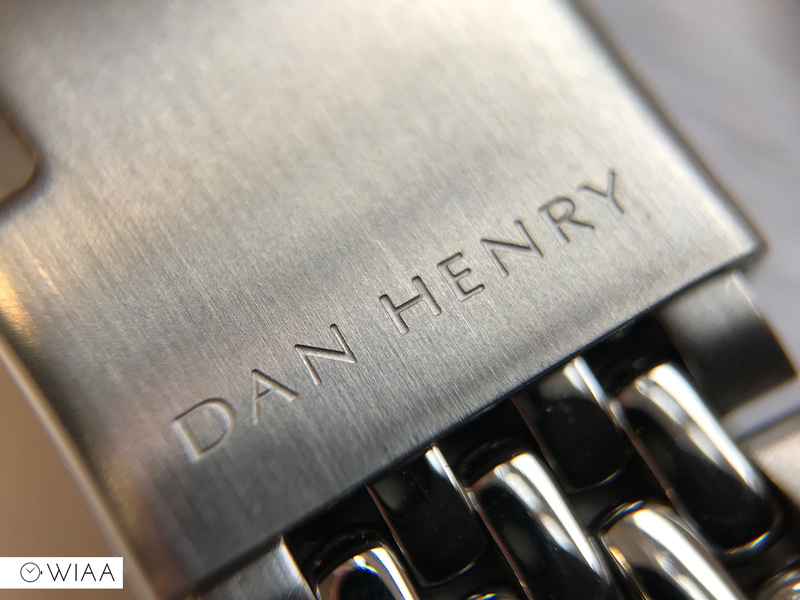 The Dan Henry 1964 is stunning to look at, with an irresistible build quality that far surpasses any expectations. It clearly appears as if it should be worth much more than its humble price tag suggests. 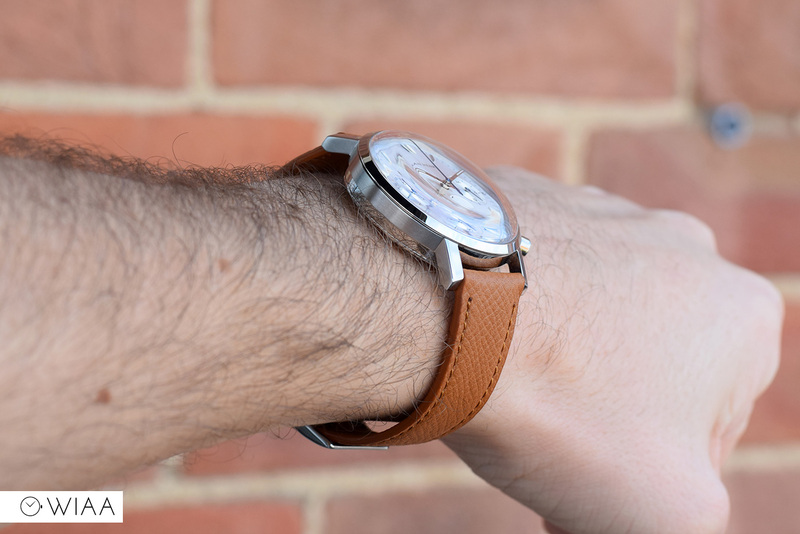 This much quality, plus the leather watch roll and two straps for under £200 ($250)? It’s been a very long time since I’ve been this impressed, and all I can say is if you dig it, get one before they sell out. 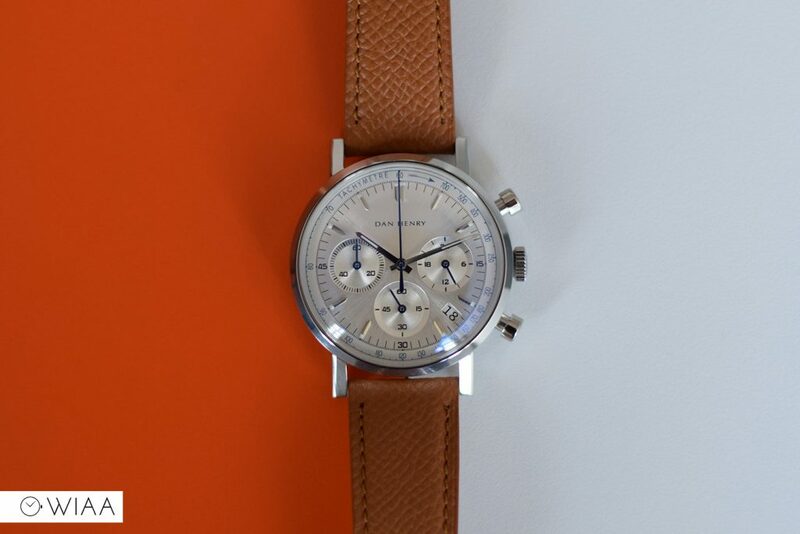 My watch arrived yesterday from New Jersey.Billing is in Hong Kong. Notify your credit card company before ordering as this is an offshore purchase. Only negative was NO Instuction BOOK. supplied. 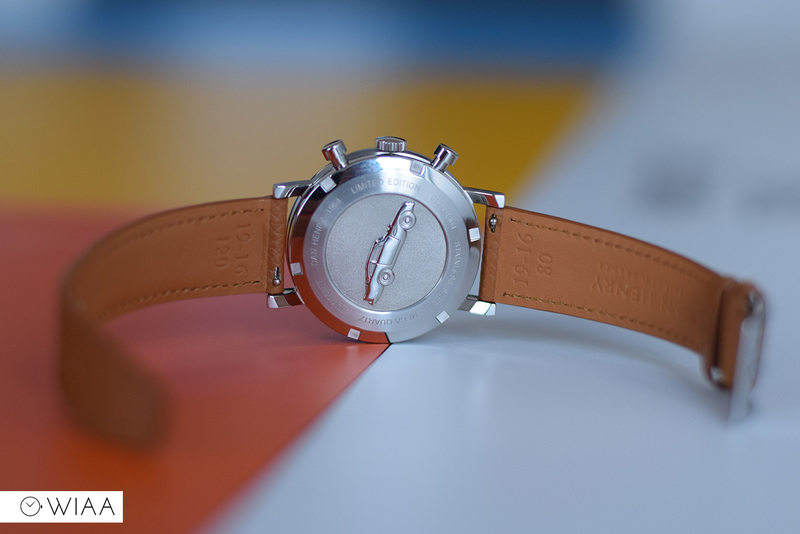 Otherwise a very nice watch.